I don’t know about you, but every once in a while I love Mexican food and really need a fix. I like everything from the fanciest tapas restaurant to Taco Bell. When I’m going to a nice restaurant I love enchiladas. At Taco Bell, I want a Mexican pizza. This dish is a lovely combination of those two flavors but far healthier than most recipes. With the veggies, lime juice, and cilantro, these enchiladas have a delicious fresh taste. The black beans smashed up make a wonderful – and much healthier – substitution to the more traditional refried beans. The mozzarella cheese is a surprisingly good addition as well. The best of both an enchilada and a Mexican pizza. In a large pot, combine corn, bell peppers, 2 tablespoons lime juice, 1 tablespoon chili powder, tomatoes and greens and cook over medium-high heat until liquid is almost evaporated, about 10 minutes. Meanwhile, in a large bowl, mash beans with 2 tablespoons cilantro, and remaining 1/2 tablespoon chili powder and 1 tablespoon lime juice. Arrange four tortillas on a large parchment paper-lined baking sheet. Spread bean mixture evenly on tortillas. Top each with about 1/2 cup of the vegetable mixture and some cheese. 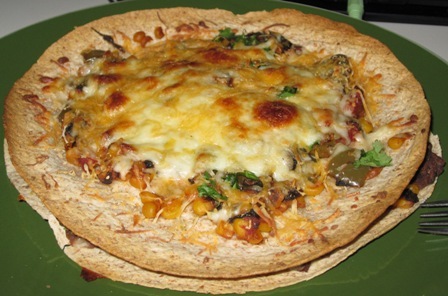 Top with remaining tortillas, vegetables and cheese and bake until hot throughout and cheese is melted, about 15 minutes. Transfer to plates, garnish with remaining cilantro and lime wedges and serve. This makes 4 individual servings. Mexican food is one of my favorites. These look tasty. I love the mix of cilantro and lime. Oh man. Me too! You should check out the newest post I put up. That is, if you like shrimp as well. Cilantro Lime Shrimp.